These types of hybrid pitches offer a softer and safer playing surface that prevents injury and increases playing time. In fact, hybrid pitches offer three times more durability than their all-natural counterparts. By stitching thousands of yards of plastic fibre into the pitch, the natural blades have something to anchor on to and the entire surface is reinforced. It drains more effectively too, so the surface stays playable. The home team, Russia, will play all their matches on the new surface. It seems to have excellent playability too, if Russia's 5-0 drubbing of Saudi Arabia was anything to go by! Although originally Astro turf was conceived as a sports playing surface, these days artificial grasses are very much at home in the domestic garden. The benefits for home use are obvious. Although the only football that gets played on your artificial turf may be a kick-about with the kids, you'll enjoy the same durability and free drainage as a professional pitch. And while a professional groundsman may have to get his ride-on mower out to keep everything looking pristine and at optimum playing height, you can pick and choose the right blade length for you and then never mow again. In fact, if you want to enjoy a whole summer, autumn, winter and spring of sport, laying artificial grass turf is a no-brainer. No more muddy footie boots or trainers, and you, the kids and your pets can all use your new fake lawn come rain or come shine. Whereas hybrid grasses rely on stitching in synthetic fibres, your synthetic lawn does best when you pay attention to the way it's laid. Make sure to dig out the area where the lawn will be laid, then install a weed-inhibiting membrane followed by free-draining aggregate. Finally, add your chosen synthetic grass on top and brush in sand as an infill. If you're laying directly over concrete, add a rubber shock-absorbing mat for comfort underfoot. Properly installed, you'll still be enjoying your Astro turf when the next World Cup rolls around - and the next and the next! 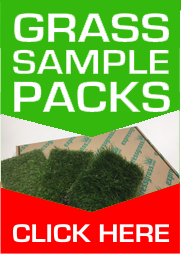 We offer a wide range of fake grass, from the fun and colourful to the 'I can't believe it's not real' variety. Just browse the website to decide on the style and blade height that's right for you, and then contact our friendly and knowledgeable team. They'll be able to advise you on all the accessories you need for the perfect installation so your lawn continues to look good, no matter what you, your friends and family throw at it!